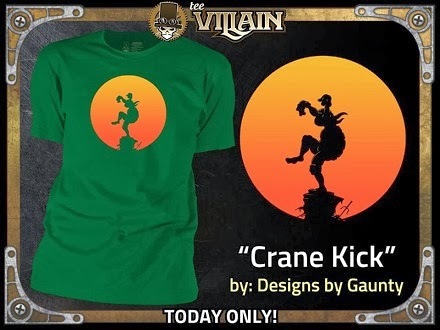 I'm beyond stoked to see Gaunty's "Crane Kick" up for sale at teeVillain. I've been waiting patiently for someone to print this super combo since the design appeared last April. The illustration perfectly sums up what most kids in the 80s thought martial arts was all about. It's hard to decide between the green and black t shirt options, they both look awesome. Claim yours today, 02.11.14, for the low price of $11.